Over 35 farmers, utility staff and community members met on the morning of November 15 to learn about methods and technologies to manage energy consumption in swine barns. The event was hosted by Southwest CERT, Great River Energy, and the Minnesota Pork Producers Association. And a huge thank you to the Martin County Pork Producers for the great pork chops at lunch! Jill Eide, CEM from Great River Energy kicked off the session explaining Great River Energy and its member cooperatives focus on energy efficiency to keep production costs down. Jill described Great River Energy’s new farm audit program, “Energy Wise for your Farm” which launched this past summer with funding from the U.S. Department of Agriculture’s Rural Energy for America Program. This program covers 75% of the cost for a farm energy audit and provides a comprehensive energy management plan tailored to the farmer’s needs. A farmer’s first, simple step is to call 1-800-441-8525. GDS Associates, Great River Energy’s project partner, will review the farm’s eligibility, discuss the kinds of assessment the farmer would like, and schedule the walk-through over the phone. GDSAssociates personnel then perform the scheduled farm energy audits. See the program details to learn more. Ms. Eide noted GDS Associates energy auditors are well versed in biosecurity protocols, including shower in and out of barns, donning Tyvek suits, and waiting 72 hours between swine barn visits. Energy auditors also prefer is to perform walkthroughs between herds and will work with the farmer to schedule visits accordingly. Engine block timers (new rebate for 2019! Fritz Ebinger stepped in to share results from recent research by Kirsten Sharpe and Faculty of the UMN West Central Research & Outreach Center (WCROC). The WCROC conducted energy monitoring at six commercial swine barns near Morris, MN to better understand what equipment is being used and how that equipment impacts energy use. The study researched two breed-to-wean barns, two nursery barns, and two finisher barns. The two breed-to-wean barns had the highest energy usage per pig. Roughly 60% of the electricity used in consumption was from heat lamps. The WCROC is currently researching creep mats as a more efficient alternative to heat lamps. In the two nursery barns, the dominant energy consumption use was ventilation. This reinforced the need to maintain fan belts, keep louvres lubricated, and fan blades clean. Fritz referenced the BESS Labs tool at the University of Illinois to help understand the energy efficiency of ventilation fans. The two finisher barns, representing the most common swine barn in MN, highlighted the difference in energy usage between mechanically ventilated barns versus side curtain barns. Mechanically ventilated barns use a lot more energy, in this case almost four times more. Attendees had a good discussion about how best to track energy usage by farm site and how operators may access that data. All of the utilities in the room reinforced they are a one-stop resource for energy consumption data. Should anyone ever have data questions, they just need to call their local utility. Some utilities have that information online in easy to use spreadsheets. If you are not the listed contact for a particular meter account, you might just need to work with the owner to sign a data release to access that information. There was also a good discussion about whether the research evaluated heat lamps using 250 watt or 150 watt lamps and what a farmer might see in terms of savings between the two bulbs. Mr. Ebinger confirmed with Ms. Sharpe the lamps in the study were actually 125 watts on the more efficient end of the spectrum. To understand the savings, one would calculate current costs (250 watts/hour x number of hours of run time x cost of energy in ¢/kWh) and then compare that with the new bulb wattage. Participants indicated a lower wattage lamp would not likely be quite as high a savings as simply comparing 150 watts to 250 watts for 40% savings since farmers may end up running the 150 watt bulbs for more hours. Read more about the West Central Research and Outreach Center’s swine work. 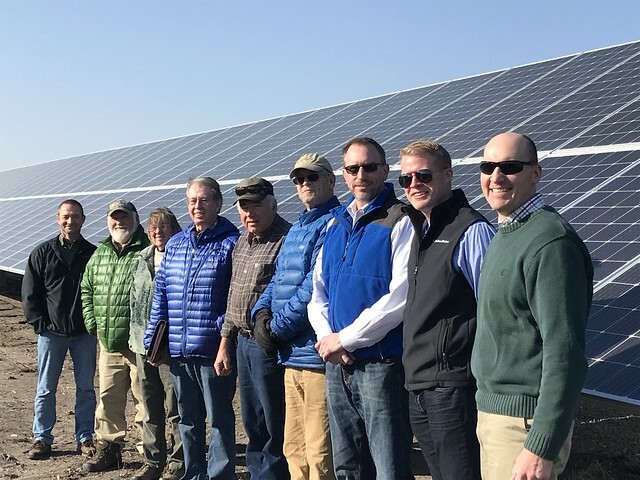 Solar Resource in Minnesota: In general Minnesota’s solar resource is good though siting a system is dependent upon local conditions and having a good southern or southwestern solar window. You can check out your site with the Minnesota Solar Suitability App to get a general sense. Through the USDA-funded Renewable Energy for Greater Minnesota program, Mr. Ebinger will come out to your farm to conduct a renewable energy site assessment and financial report. This process includes evaluating your solar resource, where to site solar (based on buildings, tile lines, points of interconnection, etc.). He will also help you review your electric bills and understand financing options and tax incentives. Installation Costs: Current solar costs for commercially installed systems are in the ballpark of $2.30-$2.50 / watt. The major component to making a project work is the tax incentives. Right now, farmers can access a 30% Federal Business Energy Investment Income Tax Credit (it has a 1 year carry back, 20 year carry forward period). This tax credit stays at 30% through 2019 and then steps down in subsequent years. Accelerated depreciation (MACRS) is another big part of the savings. Mr. Ebinger then walked through a cash flow example for a solar project. He assumed an electric rate of $0.10/kWh so if you pay less per kWh or have a demand rate, your payback time will be longer. This will depend upon your utility and your rate class. Before advancing a project, you should always work with your local utility. They can walk you through their net metering program. Financing a Project: Property Assessed Clean Energy—or PACE—can be a good option. There are two PACE programs available. One is through the St. Paul Port Authority (SPPA), and the other through the Rural Minnesota Energy Board (RMEB)! Lending is based upon equity in your property (up to 20% of the assessed tax value of your property). You then repay the loan at 5% interest for projects with paybacks of 10 years or less on your property tax bill on six month increments. The SPPA and RMEB will only lend out to projects that are cash-flow positive and are looking for projects that will save you money. Hen-Way Manufacturing is a 40-year old business with 32 employees, specializing in the manufacture of hog equipment and “anything a hog operation might need.” As solar panel prices came down about three years ago, proprietor Lonny Schwieger decided to make the move and install a 177 kW solar array to offset energy costs. The installer predicted 60% savings and Hen-Way has gone from paying, on average, $5,200/month to only $2,200/month, in line with the project estimates. Mr. Schwieger was happy they have been able to cover much of their energy usage, but now they are trying to tackle demand charges which are the largest part of their bill. The total 177 kW system cost $431,000. Hen-Way received the 30% federal tax credit which brought their total out-of-pocket cost down to $287,000. Mr. Schweiger anticipated an 8-year payback as the system is sized to offset their energy usage. Hen-Way Manufacturing is interconnected on Federated Cooperative lines and receives 3 cents/kWh (avoided cost rate) when they export power, mostly on weekends, because their system is larger than the 40 kW net metering capacity limit. CERTs is here to help you move forward with clean energy projects that make sense for your farm. From lights and fans to pumps and motors, from crop dryers to irrigation systems, there are many opportunities to save energy on the farm. Installing solar can be a great way to create energy independence for your farm or business and stabilize your energy costs.